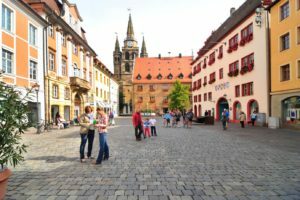 ANSBACH, Germany (Oct. 19, 2018) – “Was ist los in Franken?” details off-post community events and activities occurring throughout the Franconian region. 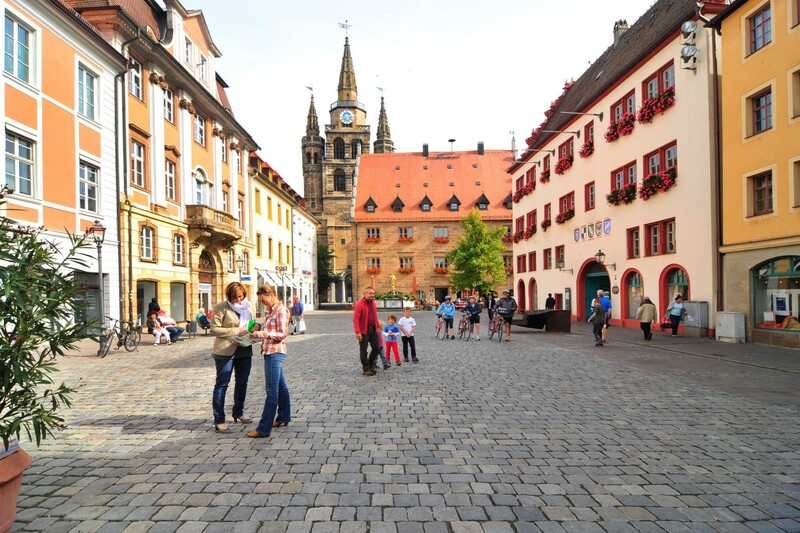 The Ansbach tourist office is offering a guided tour in English. The very knowledgeable tour guide will take participants around town and talk about more than 1250 years of history, including Baroque style facades and hidden Renaissance inner court yards, the former Markgrave´s Royal Chapel, a crypt with its 25 sarcophaguses and the Baroque Synagogue. The tour starts at the horse sculpture Anscavallo at Schlossplatz (across from the Residenz castle) Oct. 20 at 5 p.m. The 90-minute tour costs 6 euros per person and takes about 90 minutes. To learn more, contact the Ansbach Tourist Office at 0981-51-360 or akut@ansbach.de. The apple market in Fürth in the Stadtpark (Hans-Schiller-Allee) is scheduled for Oct. 21 from 10 a.m. to 5 p.m. Visitors can find out almost everything there is to know about the regional fruit, and sample Franconian dishes and beverages made from apples, pears and more. Experts in tree cutting or basket weaving show off their skills, children are entertained with games and craft projects. To learn more, visit Apfelmarkt. The Lebkuchen, a type of gingerbread, is a trademark of Nürnberg. The city hosts a Lebkuchen market to celebrate the delicacy Oct. 26 through Nov. 4 on the plaza in front of Lorenzkirche. Opening hours are 11 a.m. through 8 p.m. daily. During the fish harvest week in Dinkelsbühl Oct. 26 through Nov. 4 restaurants in town offer local fish specialties in many variations. Fish tanks with local fish on display, and vendors are located inside and outside of the Schranne. To learn more, visit Fischwoche. A “Herbstmesse” (fall fair) with a market and midway takes place on Schrannenplatz Oct. 27 through Nov. 4. To learn more, visit www.rothenburg.de or www.tourismus.rothenburg.de. The Consumenta, a large consumer’s fair, takes place at the Nürnberg Messezentrum Oct. 27 through Nov. 4; visitors can find lots of information about technology, real estate, cooking and baking, pets, horses, creative hobbies, new inventions, and much more. Opening hours are daily 9:30 a.m. through 6 p.m. To learn more, visit www.consumenta.de. The fun park Schloss Thurn in Heroldsbach near Forchheim is hosting special Halloween events Oct. 27 through Nov. 1. During the day (11 a.m. to 6 p.m.) the event is family and kid friendly, at 6:30 to 11 p.m. it turns into “scary Halloween.” To learn more, visit https://www.facebook.com/events/522769174813163/ or go to www.halloween-schloss-thurn.de. The Fish and Game Days, a culinary week in Feuchtwangen Oct. 30 through Nov. 4 bring regional and seasonal products fresh on the table at local restaurants. For more details, visit http://www.feuchtwangen.de/de/leben-wohnen/stadtbuecherei/veranstaltungen-aktuelles. An Elvis interpreter comes to Wolframs-Eschenbach on Halloween, Oct. 31. The performance will start at 7 p.m. at Gaststätte Heubusch (Hauptstraße 9 in Wolframs-Eschenbach). For more information and tickets, call 09875-97550 or send an email to rathaus@wolframs-eschenbach.de. Allerheiligen (All Saints Day) is a Christian day to remember all saints, martyrs and deceased. Following “All Hallows’ Eve” (better known as Halloween), it is observed Nov. 1 every year in Baden-Württemberg, Bayern, Nordrhein-Westfalen, Rheinland-Pfalz and Saarland, as well as in Austria and Italy. Local pubs and restaurants are hosting a “Kneipenjagd” (pub crawl) in Ansbach Nov. 3, celebrating the 20th anniversary of the event. Live bands play in different locations in town. One ticket buys admission for all locations and live bands all night long; tickets bought in advance (Brückencenter or participating pubs) cost 11 euros, others are 13 euros. For details on participating locations and program, go to https://www.facebook.com/events/863870974002507/. The Rothenburger Lichterlauf, a race in and around the torch-lit city of Rothenburg ob der Tauber, takes place Nov. 3, with children’s races, one for hobby runners and a main race. Start and finish point are at the Marktplatz in Rothenburg. For more information visit www.rothenburgerlichterlauf.de. The mini zoo for rescued tigers and other exotic animals in Ansbach-Wallersdorf is hosting their monthly open house on Sunday, Nov. 4, from 1 to 5 p.m. Guided tours take place every full hour. Visitors will be well taken care of with beverages and food. Admission is free, but donations are always welcome. To learn more, visit https://www.facebook.com/events/964762620343203/. Fürth is hosting a culinary wine fair – Wein- und Delikatessenmesse – in the Stadthalle in Fürth (Rosenstraße 50) on Nov. 10 and 11; about 100 vendors present their goods of wine, sparkling wine and spirits as well as international food specialties. Opening hours are Saturday from noon to 8 p.m. and Sunday from noon to 7 p.m.; to learn more, go to www.weinmesse-fuerth.de. Martinstag or Martini Nov. 11 commemorates St. Martin (ca. 317-397), Bishop of Tours, one of the most revered European saints. The best-known legend connected with Saint Martin is the dividing of the cloak; Martin, then a soldier in the Roman army, tore his cloak in two pieces to share it with a freezing beggar at Amiens. Later in life he became a bishop. Although Martinstag is a Catholic observance, German Protestants also consider Nov. 11 a special day, the christening day of the Protestant reformer Martin Luther (1483-1546). The protestant “Pelzemärtl” brings Franconian children little gifts. Many towns and villages organize lantern parades for elementary school kids, complete with a St. Martin on horseback and a beggar. Often a small market is connected to the holiday (not a federal holiday). Very popular is also the traditional goose dinner on Martin’s Day. For carnival fans the day also marks the beginning of the Fasching season, starting exactly at 11:11 a.m. on Nov. 11. A seasonal market with entertainment and winter themed activities takes place at the castle park in Stein Nov. 16 through 18. Gourmets can sample European delicatessen, a winter wonderland inspires decoration for the holidays. The Faber-Castell castle is located along B14 in Stein (entrance on Rednitzstraße 2a). Admission tickets range from 8 euros for adults to 1 euro for children under 12; parking is free and close by. To learn more, visit www.wintertraeume.com. Bad Windsheim is hosting a pre-seasonal advent market in the Kur & Kongress-Center (KKC on Erkenbrechtallee 2, next to the spa) Nov. 18 from 10 a.m. to 5 p.m. Visitors can find home-made seasonal products, Christmas decoration, jewelry, pottery, candles or wood carvings, and get in the mood for the holidays with seasonal music, St. Nikolaus and other entertainment. Admission for the market is 2 euros, children up to 12 years of age enter for free. To learn more, also go to www.kkc-tagen.de. The annual pumpkin festival on Ludwigsburg’s castle grounds (Marbacher Strasse 10, 71640 Ludwigsburg, Germany) is open until Nov. 4. Visitors can expect spectacular works of art created from 450 000 pumpkins and gourds, or admire more than 500 variations of the vegetable. Culinary delights like pumpkin soup, burgers or strudel can be tried on site. For more details, visit www.kuerbisausstellung-ludwigsburg.de/en or https://www.facebook.com/kuerbisausstellung.